Hello 100Pals staff. I am appealing for my use of achievement plugins on Team Fortress 2. Team Fortress 2 - I used servers with achievement plugins to get Team Fortress 2 achievements, thinking it would not have any unexpected consequences at all because I wasn't using a 3rd party program. 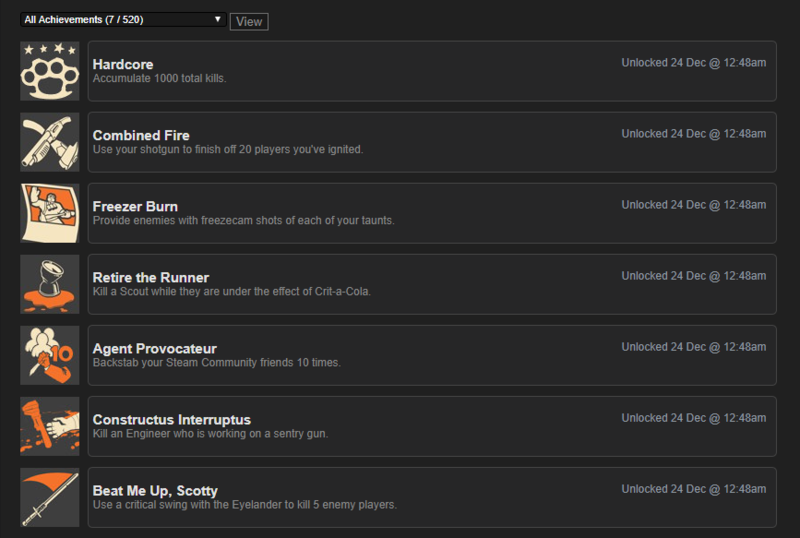 I have relocked all TF2 achievements. Thanks for taking your time to look at this, have a nice day. relocks look fine, please just make sure to start the game again and check if they stay locked. I keep getting some achievements back after starting the game, even after using the in-game "reset achievements" feature. I hope that's not an issue. Hi HackerPide , sorry for the late response. Have you tried using the ingame stat reset again in TF2? Archiving the astats appeals posts. We are currently researching solutions to this issue at this time. Can you try resetting character stats as well as achievements, and let me know if that helps? It certainly helped. Thanks again for taking your time. Thanks for being patient with us looking for a way to keep them locked.